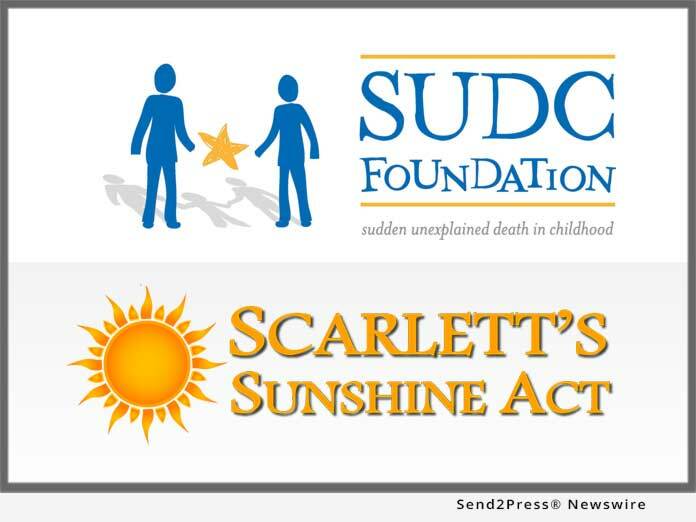 CEDAR GROVE, N.J., Oct 01, 2018 (SEND2PRESS NEWSWIRE) — The SUDC Foundation is pleased to support Scarlett’s Sunshine on Sudden Unexpected Death Act, legislation introduced by U.S. Senators Bob Casey (D-PA), Johnny Isakson (R-GA), Sherrod Brown (D-OH), and U.S. Representatives Gwen Moore (WI-04), Tom Cole (OK-04) and Jaime Herrera Beutler (WA-03) to combat Sudden Unexplained Death in Childhood (SUDC) and Sudden Unexpected Infant Death (SUID). The legislation was introduced in honor of Scarlett Pauley, who was lost to SUDC in January 2017 when she was just 16 months old.